Our project team is developing an integrated microphysiological platform with functionally connected vascular, liver and cardiac microtissues derived from a single line of human pluripotent stem cells. The platform enables functional representation of human physiology in conjunction with real-time biological readouts (via imaging and homologous reporters for all three cell phenotypes) and compatibility with high-throughput/high-content analysis. In this paper, we summarize progress made over the first year of the grant. The estimated cost of bringing a new drug to the clinic has increased to ~$1.2 billion, up from ~$800 million in 2003 . Pharmaceutical companies face their largest losses when drugs fail late, in phase III trials and at the post-marketing stage . The majority of drug recalls in the past 40 years have been due to cardiotoxicity (19% of withdrawals, including Micturin, Fen-phen, Seldane, Vioxx, Avandia), hepatotoxicity (26% of withdrawals, including Ananxyl, Alredase, Tasmar, Rezulin, Survector, Trovan, Cylert, Exanta, Prexige), or unpredicted adverse effects of drug interactions (for example, Posicor, Hismanal) [3, 4]. Drug toxicities that pass through preclinical and clinical studies may result in deaths, and are highly costly. A notable example is Vioxx that has cost Merck over $5 billion in criminal and civil settlements, and has been linked to more than 27,000 deaths . Existing preclinical models can provide a critical window into human physiology for determining drug safety and efficacy. However, as many as 60% of late-stage drug development failures are due to unforeseen absorption, distribution, metabolism, excretion, and toxicity profiles that might have been predicted if models of human liver tissue were available earlier in drug development . Likewise, existing heart models of cardiotoxicity do not always correlate with clinical risks. For example, preclinical hERG assays are quite helpful in identifying compounds with action potential prolongation, but are not sufficient for predicting clinical QT-proarrhythmia . Human microtissues platforms are now under development to improve our capability for disease modeling [7, 8] and toxicology studies [9, 10]. Overall, the lack of predictive drug-screening systems is a critical barrier to bringing drugs to patients. In spite of major advances, existing culture systems still lack many of the structural and signaling features of native tissues, the temporal and spatial sequences of molecular and physical regulatory factors, and the dynamic forces and systemic factors provided by blood circulation. Even in the best culture settings where distinct cell types of a specific organ system are co-cultured to promote tissue-specific transport and signaling, the effects of organ-organ interactions, metabolic/oxygen gradients, and cellular trafficking through tissues are still not included [9, 11]. Also, engineered tissues have only scratched the surface in attempting to model human disease. Animal models often fail to capture human-specific features, and offer only limited control of and insight into specific mechanisms. As a result, disconnect between in vitro studies, translational animal models, and human clinical studies decreases the effectiveness of the resulting therapeutic strategies. Functional human tissue units, engineered to combine biological fidelity with the use of high-throughput platforms and real-time measurement of physiological responses, would be transformative to drug screening and predictive modeling of disease. Modeling integrated human physiology in vitro is a formidable goal that has not been reached with any of the existing cell/tissue systems. Tissue engineering is now becoming increasingly successful in more authentically representing the actual environmental milieu of development, regeneration and disease progression, and in providing real-time insights into cellular and morphogenic events. While it is unreasonable to expect three-dimensional tissue models to exactly match native tissues, the models can still recapitulate certain physiological functions and be used to investigate the efficacy, safety and mode of action of therapeutic agents. Instead of attempting to achieve the entire complexity of an organ, we seek to identify the simplest functional tissue unit allowing predictive in vitro studies of normal physiology and disease. Such a minimally functional tissue unit would replicate the tissue-specific architecture (as a basis for function in most tissues) and a subset of most relevant functions. Derivation of multiple microtissues (such as heart, liver, vasculature) starting from a single population of human induced pluripotent stem (iPS) cells allows us to reach into a large genotype pool and use both the healthy cells and cells with genetic mutations for drug screening and modeling of disease. Modular microtissue platforms can then capture the salient features of multiple human tissues, by integrating tissue-specific cues within the microtissue unit (to induce physiologic cell function) with the vascular network (to assemble miniature yet functional tissue modules). These microphysiological platforms can be further interfaced with functional imaging, to enable real-time monitoring of physiological responses at molecular, cellular and tissue levels. Such interactive microtissue systems offer enormous complexity and diversity of responses to drugs and disease that can be modeled (for example, cardiotoxicity of drugs metabolized by liver in a diverse genotype pool of patients, inflammation, combinations of disease genotypes and disease environments). In the current (UH2) phase of work, we are establishing iPS cell-based vascular, liver and cardiac microtissues providing tissue-specific architectures with an integrated vascular network, microfluidic endothelialized connections between the tissue modules, functional representation of human biology of health, injury and disease (real-time biological readouts), and compatibility with high-throughput multi-tissue platforms for studies of drug toxicity and over long periods of time (≥4 weeks). The work is being done using iPS cells (to provide a large diversity of normal and disease genotypes) with non-destructive monitoring of the tissue architecture and function (for real-time insights into the progression of biological responses). In the subsequent (UH3) phase of work, we aim to deploy an integrated cardiac-hepatic-vascular platform and demonstrate its utility for predictive studies of human physiology. Towards these goals, we are pursuing a set of co-ordinated aims with constant feedback and monitoring of the milestones. Aim 1 is to develop cell-type specific labeling and sensing systems for online assessment of tissue architecture and cell function. Aim 2 is to develop a perfusable branching vascular network serving as a model of the vascular bed and for assembling vascularized liver and cardiac tissues. Aim 3 is to develop a liver module by assembling hepatic microtissues in hydrogel around the vascular tree. Aim 4 is to develop a cardiac module by assembling matured cardiac microtissues in hydrogel around the vascular tree. Aim 5 is to conduct studies of disease susceptibility, for the individual tissue modules and in the multi-tissue platform. Aim 6 is to investigate human physiology and disease in multi-tissue platforms. This way, we aim to develop a new technology for studies of drugs in human tissue models. If successful, the proposed approach would radically enhance the translation of drug discovery into human applications. Representative results for the first project year are summarized in Figures 1 and 2, and in several publications [8, 10, 12–27]. HeLiVa platform design. (A) Modular design of the culture platform, with interlocking culture chambers (the same external design, different internal designs) connected to each other and the microfluidic channels for medium perfusion. A single top and bottom plate are formed by connecting the individual chamber tops and bottoms, and sealed together to form a culture platform. (B) Chamber design for a cardiac microtissue forming around a sugar lattice (that dissolves to leave vascular network channels) and two posts (designed to subject cardiac tissue to mechanical strain, and also to serve for optical measurement of force generation by the cells), between two electrodes for electrical stimulation (the whole row of chambers shares a single pair of electrodes). (C) Chamber design for a liver microtissue, also forming around a sugar lattice (that dissolves to leave vascular network channels). For all chambers, ports are provided for fluid inlets and outlets and sample retrieval. (D) Platforms with cardiac microtissues. (E) Liver chamber. (F) Sugar lattices. (G) Contractile cardiac microtissue grown from induced pluripotent stem (iPS) cells after 4 weeks of cultivation. (H) Even propagation of electrical signals through cardiac tissue obtained from human endothelial stem cells cultured in a hydrogel derived from porcine heart tissue, measured by printed microelectrodes. (I) Vascular channels were generated by three-dimensional printing of sugar-based sacrificial filaments and coated by human endothelial cells. (J) The endothelium forms a tight barrier between lumen and interstitium (not shown), and when exposed to a gradient of angiogenic factors undergoes angiogenic sprouting that leads to new perfusable vascular networks. (K) Mature sprout stained for podocalyxin (red). Below are cross-sections of the tip cell (showing no lumen or spatial podocalyxin localization) and stalk (showing podocalyxin staining at the apical side). (L) Neovessel. (M) iPS cell-derived endothelial cells cultured on an OP9 feeder layer, staining for VE-cadherin (VE-Cad) and CD31 (merged image) and 4',6'-diamino-2-phenylindole (DAPI; blue). (K), (L) Images reproduced with permission . Screening approaches. (A) Differentiation of induced pluripotent stem (iPS) cells into hepatocytes, by recapitulating normal stages of liver development (the same strategy is pursued for iPS cardiomyocytes). Hepatocyte-like cells derived this way still have a fetal phenotype. (B) To mature the cells, we designed a small molecule screen where we treated iPS cell-derived hepatocytes (iHeps) from day 20 of the differentiation for 9 days, and found a few molecules that improved the maturation of iPS cell-derived hepatocytes. (C) Results are for the top hit of small-molecule screening. (D) Aggregates of cryopreserved primary human hepatocytes (~5 hepatocytes/5 fibroblasts per aggregate) are microfluidically encapsulated into uniform droplets in a microfluidic device, and photopolymerized to form microtissues. (E) Viable cells in liver microtissues (scale bar = 100 μm). bFGF, basic fibroblast growth factor; BMP4, bone morphogenetic protein 4; ELISA, enzyme-linked immunosorbent assay; HGF, hepatocyte growth factor; OSM, oncostatin M; (C) Image reproduced with permission . Our laboratories have continued interest and strong expertise in biophysical regulation of the fate and function of stem cells and their differentiated progeny using molecular, cellular, matrix-derived and physical factors. We will continue to use these approaches for directed differentiation of stem cells into endothelial, cardiac and hepatic lineages, and maturation of the resulting differentiated cells. To create clinically relevant human tissue models, we aim to generate all cell types needed for tissue construction from the same batch of iPS cells. In order to allow use of molecular and functional imaging and study physiological processes at multiple hierarchical levels and in real time, we are now incorporating biosensors (reporters) into the iPS cells to monitor specific cell phenotypes in culture (for example, distinguish between endothelial cells and cardiomyocytes), and to monitor functional readouts for tissue cells. Thus far, we have established culture conditions for routine and robust generation of endothelial cells that exhibit co-expression of cell surface markers (that is, CD31, VE-cadherin) and functional properties (endothelial nitric oxide synthase production, tube formation) from multiple iPS cell lines with at least 10 to 40% efficiency . We have recently adopted the culture conditions used by the Bhatia and Vunjak-Novakovic laboratories to maintain the specific iPS cell line that we are using to create the reporter lines (iPS C2a). We are now optimizing the conditions for endothelial cell-specific differentiation of this specific cell line. We are now generating reporter cell lines using Talens  for homologous recombination in the iPS C2a cells (iPS endothelial cells, VEcad/GFP; iPS cardiomyocytes, beta-MHC/FRFP; and iPS hepatocytes, CYP3A4/RFP). By this time, we have developed a general approach to rapidly construct perfusable vascular networks to support three-dimensional culture of tissues. We printed three-dimensionally the rigid filament networks of a carbohydrate glass, and used them as a cytocompatible sacrificial template in engineered tissues containing living cells to generate networks lined with endothelial cells and perfused with blood under high-pressure pulsatile flow [20–23]. We have developed several methods to generate channel architectures within matrix scaffolds using either sacrificial filaments printed in sugars  or gelatin , or using needles that are withdrawn from the material . In all of these cases, seeding human endothelial cells into these channels results in the formation of well-developed endothelium that exhibits characteristics of functional endothelium. We have observed intraluminal flows at high rates relative to extraluminal flow, and identified tight junctions that were permeable to transluminal leakage only when cells are exposed to vasoactive permeating factors. To facilitate assembly of the HeLiVa platform, we have also developed a mechanism that allows easy plug-in of input and output microfluidic tubing to ultimately drive the perfusion within the vascular bed and connect multiple organ systems . In parallel, we have begun to explore methods to integrate the vascular perfusion approaches with the cardiac microtissue platform. 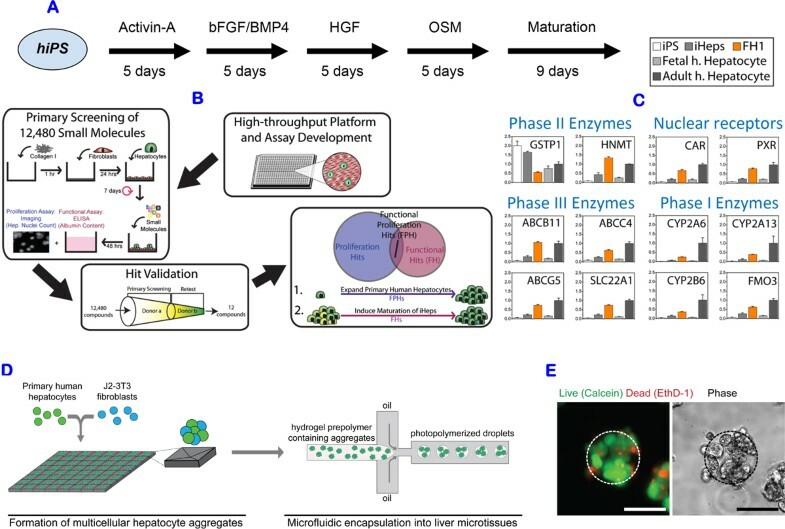 We initially focused on generating hepatic microtissues from cryopreserved human hepatocytes, and then extended the established methods to a variety of cell types including iPS cell-derived hepatocytes. An integral part of this effort was the development of platforms for scalable control of tissue architectures [24, 27]. To help maintain hepatocyte phenotype, we first co-cultured the primary hepatocytes with supportive fibroblasts by seeding the two cell types into an array of pyramidal microwells. Defined clusters of hepatocytes and fibroblasts (approximately five hepatocytes and five fibroblasts) in each microwell formed multicellular aggregates over 24 hours. These primary hepatocyte aggregates were then removed, encapsulated in microfluidically generated droplets of polyethylene glycol diacrylate prepolymer, and photopolymerized to form hepatocyte-laden hydrogel microtissues. Resulting liver microtissues are viable as evaluated by live-dead staining, and exhibit stable phenotypic function, secreting albumin for over 2 weeks. Towards an iPS cell-derived liver module, we have generated morphologically identifiable hepatocytes from human iPS cells with differentiation efficiencies >90%, as quantified by albumin and α1-antitrypsin immunofluorescence, and identified small molecules for human hepatocyte expansion and iPS cell differentiation . iPS cell-derived hepatocytes were additionally validated through characterization of urea production, albumin and α1-antitrypsin secretion, and phase I drug metabolism activity. Notably, liver microtissues were successfully used to model hepatitis C infection . We established protocols for differentiation of iPS cell lines into contractile cardiomyocytes, for three lines of iPS cells. Over the last 6 months we focused on one specific line, iPS C2a, which is now shared between all four laboratories. After systematically investigating several variations of staged molecular induction in three different settings (embryoid bodies, monolayers and pseudo-monolayers), we came to our protocol of choice that yields ~65% of differentiated cardiomyocytes (as evaluated by Troponin staining and contractile function). By micromanipulation (picking of beating areas), the yield of the protocol can be increased to >80%, as compared with our target go-no-go criterion of >30%. Simple microfluidic platforms [12, 27] were instrumental in the development of protocols for directed differentiation of stem cells. The resulting iPS cardiomyocytes, although functional, remain immature. To promote cardiomyocyte maturation, we applied electromechanical conditioning, following molecular induction (7 days, 5 V/cm, 2 ms square waves, frequency = 0, 0.5 Hz, 1 Hz, 2 Hz). The protocols were fully established for human embryonic stem cell cardiomyocytes and are now translated to iPS C2a cardiomyocytes. Electrical stimulation increased the strain of contractions in cardiac microtissues. In parallel, the contractions became synchronized and the strain generated by cardiac microtissues increased as the stimulation frequency increased. We have developed the second working prototype of our platform, in which we have tested the assembly and perfusion of cardiac microtissues formed from iPS C2a cells, and recently started testing with iPS hepatocytes. The culture chambers have a space for the formation of cardiac microtissues from a suspension of iPS cardiomyocyte micro-aggregates in hydrogel. The hydrogel forms around the sugar lattice, between two electrodes, and around two posts (that at the same time stretch the cardiac microtissues, and enable optical measurement of the force generated by the cells from the deflection of the posts). To design the posts (material composition, geometry) we conducted analyses of the strain distribution in contracting cardiac organoids. We are now assembling subsections of the integrated microphysiologic platform, for further testing and for obtaining feedback to the individual chamber design. We have established methods to derive, starting from the same population of iPS cells (using the line C2a as the main experimental model), functional endothelial cells, cardiomyocytes and hepatocytes of high fidelity. We have also developed methods for maturation of differentiated cells, using small molecules (for hepatocytes) and physical signals (for cardiomyocytes). 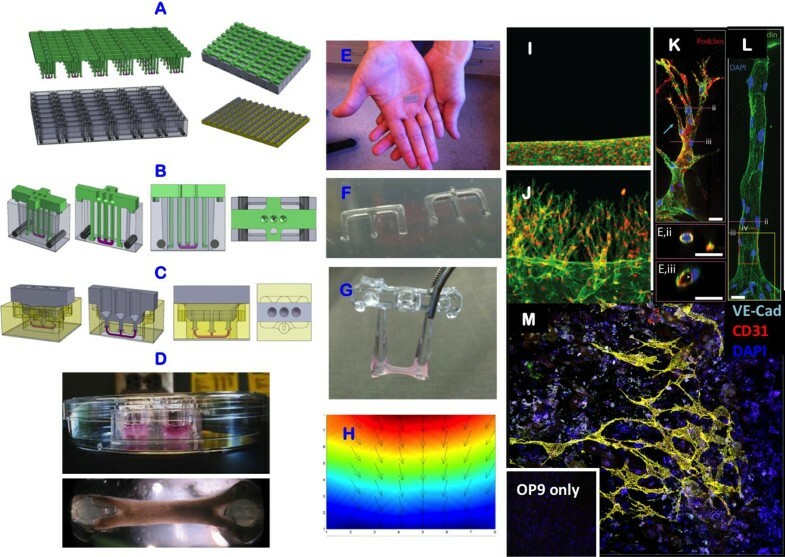 The first prototypes of microfluidic platforms for the formation and cultivation of vascular, cardiac and hepatic microtissues are now being used to demonstrate utility of human iPS cell-derived microtissues for physiological and pharmacological studies. Our immediate goals are to refine our microtissues by incorporating the vascular bed, to establish modular multi-tissue platforms, and to use these platforms in studies of interactive responses of cardiac, vascular and hepatic microtissues to pharmacological agents, physiological and pathological stimuli. The work summarized here has been planned and conducted in close collaboration of the four laboratories at Columbia University, Massachusetts Institute of Technology, University of Pennsylvania (the PI now relocated to Boston University and Wys Institute), and Yale University, within the Microphysiological Systems Initiative and with funding support from the National Institutes of Health (grant UH2 EB017103). The publication costs for this article were funded by NIH grant UH2 EB 17103.